Get Ready to Be Equipped to Pass on Your Faith Like Never Before! If you had a resource you could use which would equip you to engage the children you love in reading God's Word, understanding God's Word and applying God's Word, would you use it and recommend it to the people you know? If this resource would help your family develop a strong, "Family Faith History", would you use it and recommend it to the people you know? If it cost less than a bag of chips each month, would you use it and recommend it to the people you know? Well . . . stay tuned! In the coming month I'll be announcing and releasing just such a resource! Get ready! Things are about to change when it comes to helping your family pass on a heritage of faith! 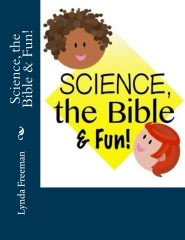 New Look for Books by Lynda! As you've likely noticed, this morning I changed the look for this blog - Books by Lynda. I decided to make it a little more "crisp" and hope you like the new look. You will be able to find my list of the books I've written - with the links to where you will be able to purchase your own copies, if you "click" on the three lines to the top left of the title - "Books by Lynda". Thank you for reading this blog and for your interest in my books. 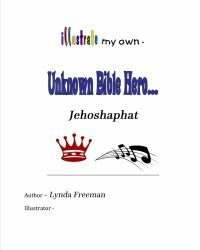 I'm currently working on a new book and a special project for grandparents, parents and grandchildren/children of all ages! Stay tuned for more information! 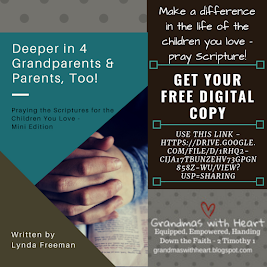 Equip Parents & Grandparents - Give Them Resources . . . Illustrate My Own! One of the best things you can do to see children reached for Jesus and then help them grow in their walk with Him, is to equip parents and grandparents, so they are able to pass on a heritage of faith to the children they love. No matter how much time you put into your Children’s Ministry, you will never have as much time, and therefore as much influence, as the parents and grandparents, so it only makes sense to spend time, significant time, focused on intentionally equipping them so they are able to pass on their faith. This is not to say anything else you do does not matter, because it does. 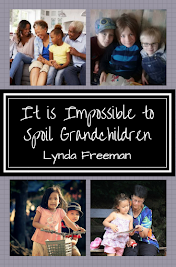 You will always have children who do not have believers for parents or grandparents; clearly those parents/grandparents will not be able to pass on faith. You will also have parents and grandparents who think it is the church’s job to teach their children and are not willing to do it. This year I’ve been praying through the book of Psalms for my family. Each week I have a different passage from Psalms which I work through, praying specifically and intentionally each day focusing on a different portion of the passage for the week. This week I’m praying through Psalms 107 – with the focus upon praying the following . . .